It’s truly how amazing how many film festivals are going on at any given time throughout the year. At first I just compiled those for New York City, but then I dug further and found the others across the country too! So here’s July in order of when they are starting in the month. Please comment if you know of any others and I’ll add them to the calendar. Latinbeat (July 11 – 20) Featuring films from an array of genres and styles, Latinbeat follows the latest trends of filmmaking in Latin America by showcasing both up-and-coming directors and filmmakers whose work we have proudly premiered in the past. NewFest (July 24 – 29) NewFest is dedicated to bringing together filmmakers and audiences in the building of a community that passionately supports giving greater visibility and voice to a wide range of expressions and representations of the LGBT experience. Sound + Vision (July 31 – August 6) Our music documentary series explores an exciting range of artists, genres and styles. newportFILM (ongoing throughout the year ) newportFILM was founded in 2010 to nurture discovery, creative achievement and community dialogue through the art of documentary film. Serving and celebrating both the film artists and the audiences who view their work, we seek to expand on Newport’s proud history of culture and artistic patronage by bringing new and timeless voices in film to the Rhode Island community. Newark Black Film Festival (FREE ADMISSION) (June 25 – 30) Since its inception in 1974, the Newark Black Film Festival (NBFF) has become known among its peers as the longest running black film festival in the United States. Throughout the years, it has continued to provide a progressive public forum for hundreds of emerging writers, directors, producers, performers and film buffs who enjoy African American and African Diaspora cinema. Screening in the summer months, the films that are shown reflect the full diversity of the black experience in America, both past and present. Each film selection encompasses a wide range of cinematic forms and formulas, from documentary to the avant-garde, for youth and adults. Marfa Film Festival (July 2 – 6) Marfa Film Festival : is a festival dedicated to showcasing a strong vibrant blend of short , feature doc + narrative and experimental films in Marfa Tx. Downtown Film Festival Los Angeles (July 9 – 19) Downtown Film Festival L.A. is Los Angeles’ premiere independent film festival. Established in 2008 as a nonprofit organization, the festival is dedicated to showcasing independent cinema in the historic center of the Creative Capital of the World. DFFLA also celebrate the renaissance of downtown L.A. and its unique cultural diversity. Maine International Film Festival (July 10 – 27) Founded in 1998, the Maine International Film Festival (MIFF) is a project of the Maine Film Center. During the 10 days of the festival we show nearly 100 films, representing the best of American independent and international cinema. We also spotlight some of Maine and New England’s most exciting and innovative filmmakers. Cut to the Chase Film Festival (July 11 – 13) Cut to the Chase Film Festival’s goal is to produce an annual short film festival that encourages people to engage their artistic desire, to share their imagination, opinions and vision within the framework of the Cut to The Chase Film Festival guidelines. Rochester Jewish Film Festival (July 13 – 21) The JCC of Greater Rochester established the Rochester Jewish Film Festival in 2001 to present the best contemporary Jewish themed films from around the world to the Rochester community. RJFF exists to promote awareness and pride in the diversity of the Jewish people; to strengthen community consciousness of Jewish identity, history and culture; to provide a forum for community gatherings that allows valuable dialogue; and to create an international showcase for filmmakers whose work explores Jewish themes. Fantasia International Film Festival (July 17 – August 5) Since its inception in 1996, the Fantasia International Film Festival is now recognized as the largest and most influential event of its kind in North America, a leader on the genre film scene and one of the country’s most popular film festivals. 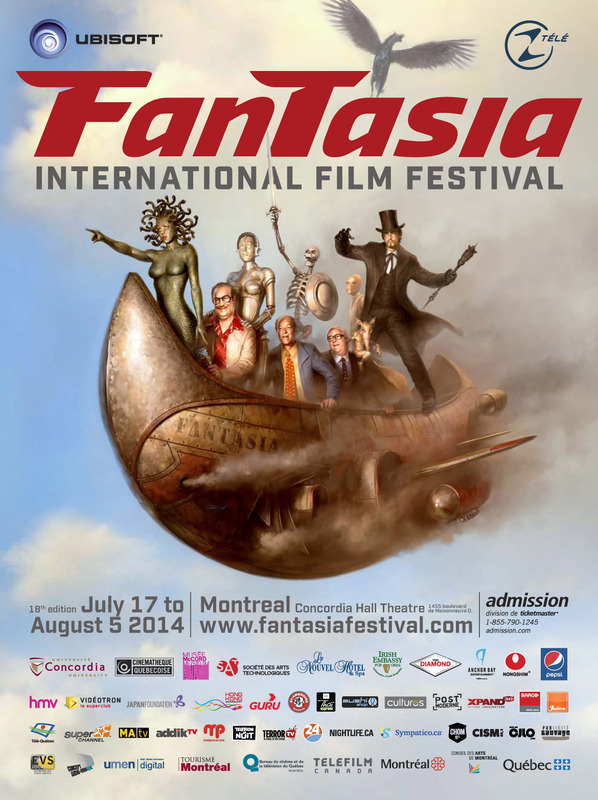 With a varied programming and an emphasis on the imaginative cinema of Asia, Europe and the Americas, Fantasia’s offerings range from unique and powerful personal visions to international commercial crowd-pleasers rarely seen in North America. Indy Film Fest (July 17 – 27) The mission of the Indianapolis International Film Festival is to create a shared experience around film by championing movies that entertain, challenge and expand perspectives in Indianapolis and beyond. San Francisco Frozen Film Festival ( July 17 – 20) (SFFFF) is a Nonprofit 501(c)(3) organization founded in 2006 that is dedicated to creating avenues for independent filmmakers, youth, filmmakers of conscience, and artists from underserved communities to come together and exhibit their work to the widest possible audience. CULPEPER- Mostly Lost Film Festival (July 17 – 19) The Mostly Lost film festival is one of the most unique cinematic gatherings on the globe. Held this year on July 17-19, the gathering is a Mecca for aficionados of early cinema who want to make a contribution to film history. The festival uses the 21st century technique of crowdsourcing to fill in the history of films from the silent and early sound eras- a time when film studios were more likely to be independent startups than today’s giant conglomerates. Robot Film Festival (July 19) The Robot Film Festival is an annual celebration of robots on screen and in performance. The event features screenings of invited films and juried selections from open-call submissions, live performances by robot entertainers, and a red-carpet awards ceremony. Blue Whiskey Independent Film Festival (July 20 – 27) The mission of the Blue Whiskey Independent Film Festival (BWiFF) is to present the greater Chicagoland area with riveting and creative independent films from all around the world that have one thing in common: a strong, powerful story. Prescott Film Festival (July 23 – 27) To provide the community with cultural events that entertain, inspire, and inform while supporting independent and critically acclaimed films and filmmakers from around the world. La Jolla International Fashion Film Festival (July 24 – 26) Empower, Support, & Recognize the individual creative professionals who make up the fashion film community worldwide. Known as the Cannes of fashion film, La Jolla will once again will be the market maker for distribution deals, director representation, and fashion film production houses. Comic-Con (July 24 – 27) Over the years, Comic-Con has become the focal point for the world of comics conventions. The event continues to offer the complete convention experience: a giant Exhibit Hall (topping over 460,000 square feet in its current incarnation); a massive programming schedule (over 600 separate events in 2012), featuring comics and all aspects of the popular arts, including hands-on workshops and educational and academic programming such as the Comics Arts Conference; anime and film screenings (including a separate film festival); games; the Will Eisner Comic Industry Awards, the “Oscars” of the comics industry; a Masquerade costume competition with prizes and trophies; an Autograph Area; an Art Show; and Portfolio Reviews, bringing together aspiring artists with major companies. New Hope Film Festival (July 25 – Aug 3) The festival’s core mission is to discover and nurture independent filmmakers, many of whom are seeking world and U.S. debuts and remain overlooked and/or underappreciated by other forums. This broad and inclusive group includes filmmakers from outside the United States. With the exception of special events, this film festival is a competition with strict rules: festival organizers do not invite films into the festival, offer fee waivers, allow personal pitches from filmmakers, distributors and/or their agents, or sanction any other practices they consider preferential treatment. All films are treated equally in the process, which begins by submitting through Withoutabox.com. Furthermore, content produced by festival organizers is never accepted at the festival, even at special events. This highly prestigious, IMDb qualifying festival is especially renowned for the quality of its lineup. Woods Hole Film Festival (July 26 – August 2) The Woods Hole Film Festival is presented by the Woods Hole Film Festival, Inc., a 501(c)(3) non-profit corporation established to: organize the annual Festival; form relationships and strategic alliances with other film festivals and organizations to showcase independent film; emphasize the work of first-time and New England filmmakers; showcase the work of independent filmmakers who have a relationship to Cape Cod or whose films are relevant to or enhance the quality of life on Cape Cod and to develop and foster a creative independent film community within the Festival and on Cape Cod. The Festival also works with individuals, businesses and institutions to develop and present programs and events that further its goals. Las Vegas Film Festival (July 30 – August 3) The Las Vegas Film Festival is a celebration of cultural discovery, community and storytelling. Connecting industry professionals with independent filmmakers from around the world, LVFF enlightens and entertains thousands of attendees while offering a creative outlet to passionate, independent storytellers. Each year, our goal is to showcase insightful documentary, short, foreign, music video and feature films from across the globe that highlight the spirit of independent filmmaking. This entry was posted in Film Festival and tagged Blue Whiskey Independent Film Festival, Boston French Film Festival, Comic-Con, CULPEPER- Mostly Lost Film Festival, Cut to the Chase Film Festival, Downtown Film Festival Los Angeles, Fantasia International Film Festival, Indy Film Fest, La Jolla International Fashion Film Festival, Las Vegas Film Festival, latinbeat, Maine International Film Festival, Marfa Film Festival, New Hope Film Festival, New York Asian Film Festival, Newark Black Film Festival, NewFest, newportFILM, Prescott Film Festival, Robot Film Festival, Rochester Jewish Film Festival, San Francisco Frozen Film Festival, Sound + Vision, Traverse City Film Festival, Woods Hole Film Festival by Melissa Hanson. Bookmark the permalink.